With the summer months approaching and grills all across America getting cleaned and ready to be fired up, let’s take our cue from the Aussies. A cue, as in barbecue! Okay that may have been a little corny (and don't get me started on corn! ), but Australians are famous for food cooked on the “barbie." We’re all familiar with that famous phrase of actor Paul Hogan’s to “slip a shrimp on the barbie." Just thinking about Australian barbecue conjures up a fun social gathering on a sunny day with wine, beer or cocktail in hand and the enticing aromas of smoky food wafting through the air. 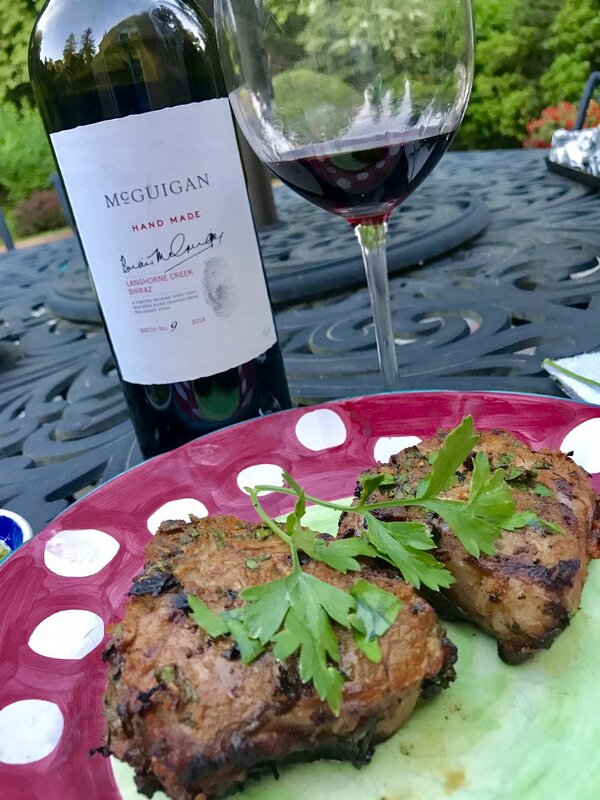 I reached out to David Lunn, export manager of Australia’s McGuigan Wines, to find out what he would cook on his barbie to pair with their exciting range of wines. I had met David at a press luncheon in New York. He was with Neil McGuigan, CEO and chief winemaker of the award-winning company whose history spans four generations. McGuigan Wines may now be one of the biggest and best-selling Australian wine brands, but the company’s roots go back to very humble beginnings. In the late 1800s Neil’s grandfather, Owen McGuigan, found work in vineyards throughout the Hunter Valley to supplement his dairy farm earnings. His son Perc then took the baton from his father and ran with it. He worked his way up from tending vines to becoming the manager of a major winery and a well-known figure in the Australian wine world. In 1992 McGuigan Wines was established by Perc's son Brian, a prominent vigneron in the Hunter Valley. Soon after, Brian's brother Neil came on board. For the more experienced wine drinkers (us baby boomers), McGuigan makes more terroir-driven, “serious” wines. I fell in love with their “Hand Made” range of Shiraz ($40) made with grapes sourced from low-yielding vineyards just outside Langhorne Creek in South Australia. The warm days and contrastingly cool nights at this location ensure both ripeness of the fruit and a mouthwatering acidity. On the palate, there is an elegant dance of fruit, spices and herbs that mingle with the firmly structured yet smooth tannins and a mouthwatering acidity. These enticing wines are like a breath of fresh air compared to the more lush, opulent style typically made in the Barossa Valley. We tasted four vintages: 2014, 2012, 2010 and 2008 and, while each year had its own unique characteristics, all four had a similar thread of finesse and structure, showcasing McGuigan’s commitment to quality. It’s no wonder that McGuigan Wines has been awarded the prestigious International Winemaker of the Year a record-breaking four times: 2009, 2011, 2012 and 2016. 1) In a small bowl, combine sugar, vinegar, lime juice, garlic, pepper, 1 tablespoon of the cilantro, salt and pepper. 2) Place shrimp in a large bowl. Add half of the chili pepper mixture and stir together. Set aside the other half of the sauce in a small bowl. Cover shrimp and refrigerate for 1 hour, stirring after 30 minutes. Meanwhile, soak 12-15 small skewers in water. 3) Remove shrimp from fridge. Thread 4-5 shrimp on each damp skewer. 4) Very lightly brush grill with oil. Heat to medium-high. Grill the shrimp for 5-7 minutes, turning over once halfway through. 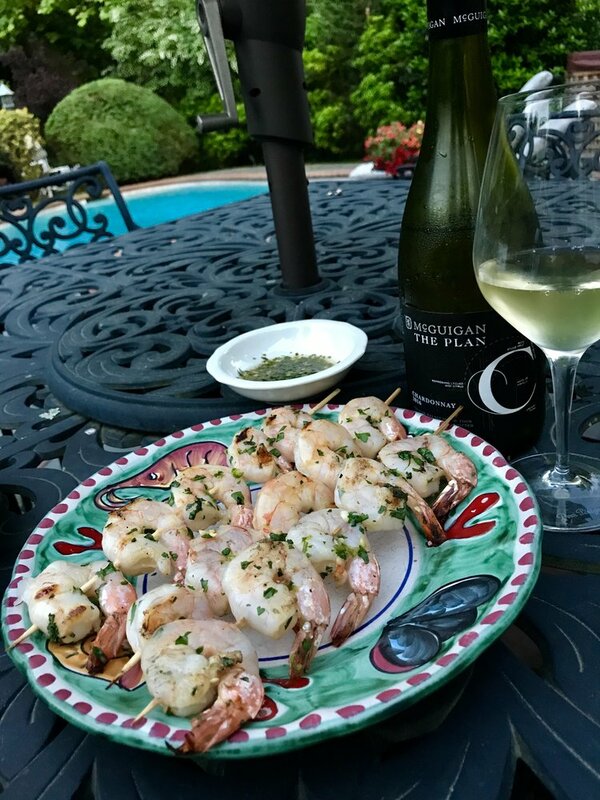 5) Place the shrimp skewers on a serving platter. Sprinkle with the remaining cilantro over the shrimp and serve with wedges of lime. Use the remaining chili pepper mixture as a dipping sauce for the shrimp. 1) In a large baking dish, combine all the ingredients, except for the lamb chops. Mix until combined, add the lamb and rub the marinade onto both sides. Cover and refrigerate for 2 hours, turn over, and refrigerate for 2 hours more. Lamb chops may be marinated overnight. 2) Preheat grill. Remove chops from marinade and salt both sides generously. Cook about 5-6 minutes per side for medium-rare. Let rest for 5 minutes before serving. David suggests serving the lamb with a spoonful of plain yogurt and a dash of sambal oelek which is a spicy mixture of chilies, salt, vinegar, and water. You can substitute sriracha sauce for the samba oelek but be careful, it’s very spicy! The Hand Made Shiraz went perfectly with cheese! My daughter's snapchat let me know her wine had arrived! La Pitchoune Makes Its NYC Debut!